A true classic and regular feature in my arsenal of cakes of mass satisfaction! The trace hint of coffee and a pinch of salt are the surprise elements that pull the taste of the dark chocolate to the foreground, resulting in the ultimate chocolate cake. Remember that no Chocolate Cake is complete without the inclusion of some actual real chocolate – cocoa powder is necessary for depth of flavour but should never be used independently to flavour a cake as it is very drying. 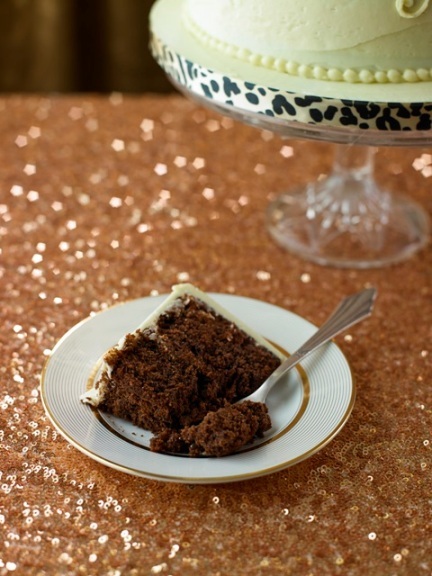 Throw away your other Chocolate Cake recipes… this is the only one you need! Melt the chocolate and the butter in a small saucepan with the instant coffee granules and water. Keep the temperature low and turn off the heat when only a few small lumps remain – these will melt in the heat of the mixture and turning the heat off early prevents burning. Weigh the flours, cocoa, bicarbonate of soda and sugar into a bowl with a pinch of salt. Make a small well in the centre and set aside. Beat the eggs, oil and buttermilk together in a jug before tipping this mixture into the dry ingredients and stirring it into a thick paste. Pour the melted chocolate and butter mixture on top of this paste and bring everything together with a wooden spoon until you have one glossy mixture in the bowl. The cake mixture will need to be poured into two lined sandwich tins. This then goes into the oven for 45-50 minutes or until a skewer comes out clean (or with only a few tiny crumbs attached to it). Allow the cake to cool completely in its tins. Fill your cake with Chocolate Buttercream or Cream Cheese Frosting and have a look at the Recipe page for fab decorating ideas! This cake lasts beautifully for around 2 weeks and freezes well too.